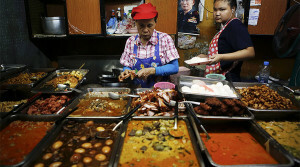 Street vendors of all kinds are facing a complete ban of their livelihood across Bangkok, the capital of Southeast Asia’s Thailand. While it may appear to be a minor move falling in line with many other nations within the “developed world,” the significance of it both to Bangkok, Thailand, and the rest of Asia in socioeconomic terms is indeed, major. Just like the “developed” nations the new ban seeks to emulate, it is driven not by a genuine desire to clear sidewalks, beautify the city, or enhance consumer health and safety. The informal sector of the Thai economy, comprising anyone who’s not covered by formal work arrangements, accounted for more than 64 percent of the total workforce in 2013. It includes street vendors and taxi-motorbike drivers, the self-employed and those operating in gray areas of the economy. They are largely counted as employed. And as technology further empowers the self-employed and is already disrupting economic monopolies in the “developed world,” such trends in a nation like Thailand with a sizable informal economy already stand to transform Bangkok into a regional, even global “grey market capital” and model for economic alternatives, start-ups, and other disruptive economic models springing up elsewhere around the world. While rational leaders within Thailand’s government have seen this as an immense opportunity, investing in start-ups, small businesses, the leveraging of technology to empower independent entrepreneurs, other interests appear threatened by the prospect of an economy shifting decisively in favor of independent business owners who are increasingly able to compete against established monopolies across multiple industries. While the actual number of users employing disruptive technology to compete against established business monopolies is small at the moment, as solutions are employed into markets, Thailand’s substantial informal economy is likely to adopt them as well. For CP executives and investors, they envision a monopoly over Thai agriculture, food, beverages, retail, telecom, and other sectors. With the prospect of street vendors being swept from Bangkok’s roads, CP’s network of convenience stores would remain one of the remaining competitors, open 24 hours a day, and providing all the amenities currently provided for by street vendors. It is a formula of perpetual growth at the expense of all else that has given rise corporations currently populating lists of Wall Street and London’s richest. However, perpetual growth shares many of the same characteristics of a natural tropism – oblivious to the future, its surroundings, or its impact on either. It simply grows until it depletes its own energy or the resources around it, then dies. A similar process is currently unfolding on Wall Street and in London, where economies driven by monopolies seeking perpetual expansion have reached both their own internal limits, and the limits of an increasingly multipolar world where not only other nation-states are producing industries competing directly with Western monopolies, but within nation-states, a more equitable balance of power is being struck by improving technology and its ability to provide larger numbers of people with direct access to the wealth of both their respective nations and the world. For CP Group, then, which has been cultivated by exceptionally ordinary businessmen and investors, it faces a future where the sort of monopoly it seeks to create and expand no longer fits into modern socioeconomic paradigms. While self-absorbed consumerism has spread throughout many segments of Thailand’s population, CP Group has already found itself labeled as an undesirable corporation amongst Thailand’s socioeconomic landscape. While it reaps immense economic rewards for its current holdings and wields demonstrably impressive political influence, it does so amid a public who is already increasingly at odds with its business practices and leadership. Moves to push street vendors off the roads of Bangkok – whether CP Group is the primary interest lobbying for this or not – will be perceived by many as yet another move made for the sake of CP’s growth and at the expense of both the Thai people and the Thai nation. While a corporate conglomerate like CP would seem like a bastion of economic strength for Thailand, its leadership has managed to turn it into a divisive liability. Its subsidiaries and other corporations operating within Thailand like it may be able to wield influence within both the former and current Thai governments, but these governments would be wise to avoid becoming a buffer between these businesses, their unpopular “plans” and the Thai people. Those within the government seeking to enhance rather than crush localism and the healthy “grey market” must continue moving forward, and distinguish themselves clearly from those beholden to lobbyists to garner the support of the Thai public who are opposed to plans to sweep street vendors from the roads of Bangkok. Should Bangkok succeed in crippling its street vendor tradition, those markets dependent on daily vendor purchases will also suffer. Those farmers who have managed to escape large agricultural corporations like CP and deliver directly to vendors or the markets who sell to them on a daily basis will also suffer. This is but one of several domino effects that may unfold if this plan moves forward. While some Thai salary workers seeking unrealistic and unsustainable consumer lifestyles depicted in advertisements may desire “beautiful sidewalks” on their way to CP’s convenience stores and the shopping malls maintained by mega-real estate developers and the foreign corporations that rent shops within them – the majority of Thai people, including the 64% dependent on the informal economy – will not only not benefit from this latest attack on street vendors – they will become a vector for sociopolitical instability both within Thailand, and perhaps even within the region. It was manipulative populist Thaksin Shinawatra who exploited destitute rural populations in his bid to divide and destroy Thailand as a sovereign nation-state between 2001-2014. Attacking the life-blood of Thailand’s informal economy, and launching that attack within Bangkok itself, may give people like Shinawatra the disenfranchised urban population he lacked as a weapon in his previous bids to stir up street violence and seize absolute power. CP and other corporations are blind tropisms driven by perpetual growth and insatiable greed. A rational government would be wise to ignore a blind, hungry force of human greed, and instead rely on the rational human wisdom that has guided and protected Thailand for centuries.